The spy drones are able to take off and land anywhere, while maneuver through city streets and hallways, and they can stop and turn on a dime, these micro-drones can also pack a lethal punch, equipped with an array of weapons and sensors, including tasers, explosives, high-resolution video cameras, infrared sensors, license plate readers, and listening devices. 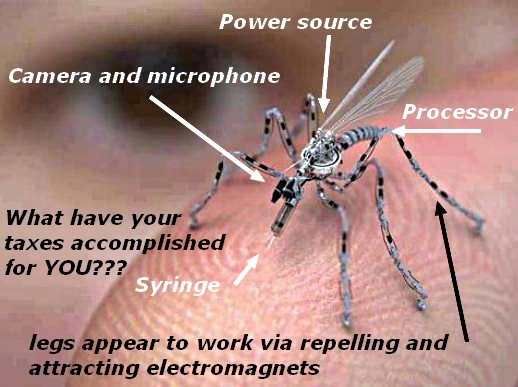 A team of researchers in conjunction with the US Air Force Office of Scientific Research is developing what they are calling a micro aerial vehicle (MAV) that will undertake various espionage tasks. 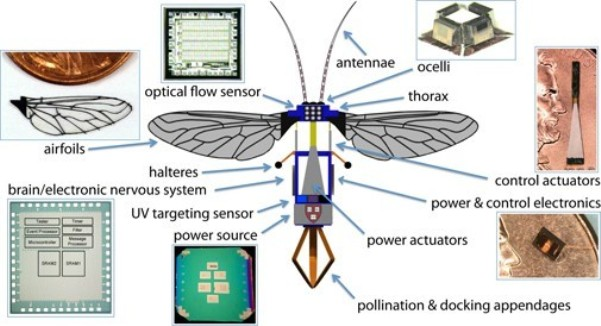 The robotic insect can effortlessly infiltrate urban areas, while being controlled from a long distance; and it is equipped with a camera and a built-in microphone. The device has the ability to land precisely on human skin, use its super-micron sized needle to take DNA samples and quickly fly off again. All the people feel is the pain of a mosquito bite without the burning sensation. The drone is hard to detect and it can inject a micro radio frequency identification (RFID) tracking device right under skin. It can also be used to inject toxins into the enemy during battle. The U.S. is not alone in miniaturizing drones that imitate nature. France, the Netherlands, and Israel are also developing similar devices. France developed flapping wing bio-inspired micro drones. The Netherlands BioMAV (Biologically Inspired AI for Micro Aerial Vehicles) also built Parrot AR drones. The Israeli Aerospace Industries (IAI) has produced a butterfly-shaped drone, weighing just 20 grams, which can gather intelligence inside buildings. Shaped like a bird, the “Nano Hummingbird” drone is negligibly larger than an actual hummingbird and fits in the palm of one’s hand. It flies effortless, blending in with its surroundings. It is capable of maneuvering through windows and inside buildings. The hummingbird drone, built by AeroVironment, is able to fly forwards, backwards, and sideways, as well as rotate clockwise and counterclockwise. Not only does the drone resemble its avian inspiration in size, it looks remarkably like a hummingbird in flight. Researchers have created a robotic dragonfly that that flies like a bird and hovers like an insect. It is designed for aerial photography, advanced gaming, R&D and security. The TechJect Dragonfly can be used for any task requiring live and mobile video feed; such as photography, home/workplace security, swarm robotics, advanced gaming and spying. The dragonfly drones are being developed to have data imputed in real-time to facilitate decision-making with the expectation of providing an overall picture for the remote controllers. These drones were designed to mimic insect flight patterns. They use high-frequency wings to hover over targets and perch to save battery life. Technology is being developed to allow the drones to syphon electricity from wires and other power sources to be able to continue operations for days or weeks. Scientists are also working on the development of miniature spider-like robots, which will be capable of carrying out intelligence-gathering tasks. It’s estimated that as much as 30% of the population has some degree of arachnophobia, making it one of the more common fears among humanity. This is logical, as spiders are creepy, erratic, and very fast runners. Now, robotics researchers have built something that is even scarier— a six-legged robot that looks like a spider, but moves faster and more efficiently. Now’s the time to find a chair to climb on. There is nothing that makes the blood run cold than the sight of a roach darting across the floor. What if this cockroach was running to save you? That's what researchers at UC Berkeley had in mind when they designed CRAM, a robot prototype that looks just like a cockroach. It has a jointed exoskeleton and a soft shell that allows it to shape shift and move through small spaces. The researchers think CRAM, whose existence was partially funded by the US Army, could be the first step in creating an incredibly effective search-and-rescue or intelligence gathering robot. What’s impressive about these cockroaches is that they can run as fast through a quarter-inch gap as a half-inch gap, by reorienting their legs completely out to the side. They’re about half an inch tall when they run freely, but can squish their bodies to one-tenth of an inch—the height of two stacked pennies. The Polish military will soon have “Bee” drones’ accompanying its armored personnel carriers. A Polish firm says it has developed incredibly tiny drones that can fly over battlefields for 30 minutes. This is a communications system, which operates superbly in battle conditions. These drones don’t just offer surveillance capabilities; they can attack small targets with explosive charges. The Bee’s head has two built-in cameras and is electromechanically stabilized by a gyroscope. Once the Bee drones are close enough to their targets, they can explode. A robot bug that can land when no one is around and then stay quietly attached to the ceiling, without the need for audible motors, and that can wait to take off until no one is around, could be quite a benefit for surveillance. 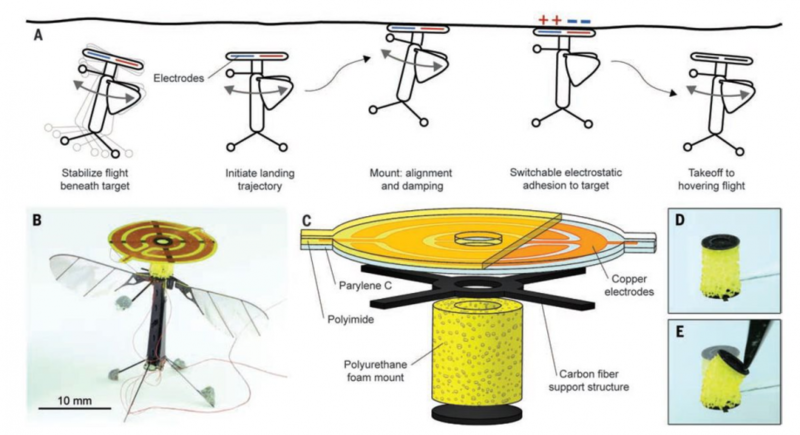 Another bee-inspired micro aerial vehicle robot has an attached electrostatic patch consisting of a carbon-fiber base, copper electrodes and a polyamide coating. It sits on a small foam cylinder. Which makes for soft landings. When charged, the electrostatic plate can attach itself to almost any surface. Such as wood, glass, or any organic material that responds to static electricity. This technology will work equally well on the ground or ceiling; but perching on an overhang is more challenging since there needs to be an adhesive force to overcome gravity. By using electrostatic energy, the researchers substantially increased the type of materials and situations where the robot can land and take off again. The robot can slow down until it’s hovering right underneath the landing spot and then rise up slowly until it's touching the surface. At this point, the researchers power up the electrostatic patch, which creates a bind strong enough to hold the robot in place, even after it powers down its flight motor. Why build a robot that can fly, land and take off like a bug or crawl along the floor? Because it can do things people can’t do, and could become a critical component in surveillance as well as search and rescue operations.